We have mobile apps down to a science. The problem was never the difficulty of the technology - it was the difficulty of the process...and we’ve revolutionized that. Now, we’re changing the way Apps are made. • View Pricing, Services, etc. If you want to sit back, relax & have us do everything, then book a free consultation or call us. Don’t worry, it’s quick & painless. We basically just want to know more about your project, so we can make it awesome. Ready to work with us or just want to talk to a human? We’d love to hear from you. Our headquarters and main office is right in the heart of the Midwest, in Chicago. If you’re in the Downtown or Streeterville area you can even come by and see us! 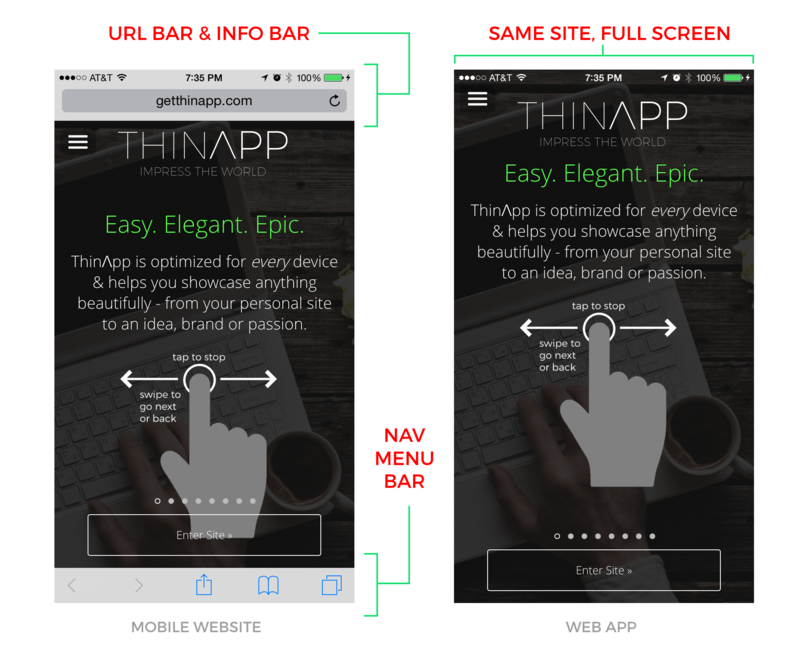 ThinΛpp specializes in "wrapping", copying and integrating existing websites (or content) seamlessly with real, hand-crafted, native mobile apps. We’ve pre-built the most common features, so that we can get your custom App submitted to the App Stores within a mere hour or less. 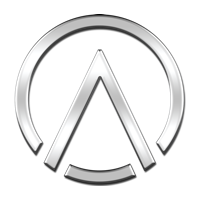 Our approach, focus and apps are simple, elegant and sleek - and no other service on earth can compare to our design, process - and value. Simply put...we're changing the way mobile apps are made. 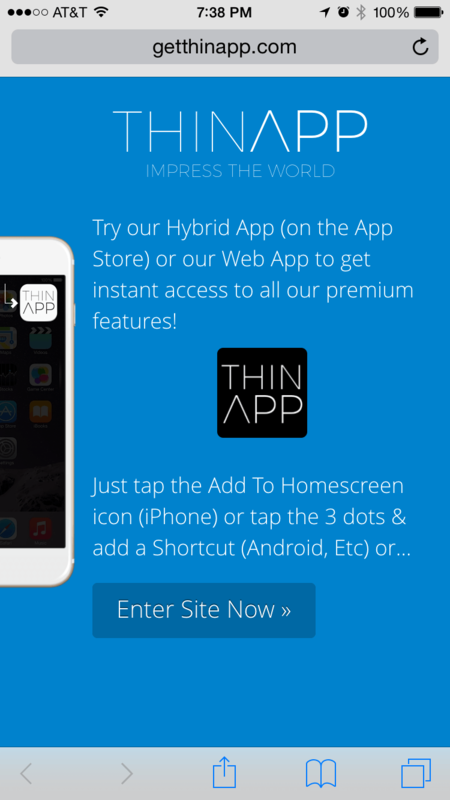 ThinΛpp BΛSE is a pre-built Hybrid App platform that makes it easy and affordable to create a custom mobile App - for any business, passion, interest, website or idea. 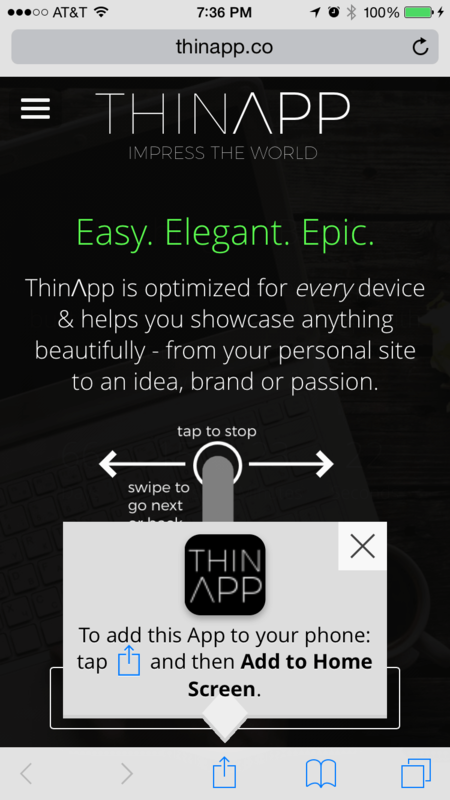 What makes ThinΛpp BΛSE so unique is that while the giants like Apple and Google battle for App dominance, we’ve made a product that is not platform/device specific - and works on everything - and is way more affordable, easy to make - and easier to understand. Google’s announcement simply proves that there is an increasing interest in creating Apps that do not need to be downloaded. However, ThinΛpp does have an App Wrapper version, which allows it to be downloaded from the App Store and Google Play. Close this screen and scroll to the bottom of the Overview page to enter your email to receive	an invite to test our live App Wrapper out, which is also how we’ll let you test your Native App(s) out before they are submitted and deployed (ie. made live). So when you become a ThinΛpp Owner - you're getting a $50,000+ App/Website for about $499 + how much ever you decide to add/spend in exclusive customizations. There's currently no value like this in the world.